1) This paper has been presented as the keynote address at the Opening Ceremony of the FIG Working Week 2008 in Stockholm, Sweden 15 June 2008. I am very pleased to be here with you today. UN-HABITAT and FIG have a shared history that goes back to over two decades of fruitful collaboration. In this regard, I would also like to congratulate the Swedish FIG on its 100th Anniversary. I am also pleased to be in Stockholm. UN-HABITAT and the City of Stockholm also have a shared history that goes back to 1972 when the concept of sustainable development was born. The process that led to formalising that concept would eventually lead to the creation of UN-HABITAT four years later in the City of Vancouver, in Canada. The theme highlights the need to attract a new generation of surveyors. The theme also refers to the need for new capacities to address new priorities. These are important themes for today’s world. I would like to present two critical issues that we see – from the perspective of the U.N. and UN-HABITAT in particular – as shaping the global debate on sustainable development. These two issues are urbanisation and climate change and, as you will see, they are closely inter-linked. I would also like to take advantage of this opportunity to reflect on the role that surveyors and land specialists can play in addressing these challenges. Let’s begin with the Challenge of Unsustainable Urbanisation. It is no secret: the world is becoming more urban. It’s also no secret that this process of urbanisation cannot be reversed; sending people back to their villages simply does not work; it never did and it never will. People move to cities because they expect a better life. It is this expectation that motivates people. Often, however, the expectation is illusory. Cities are not prepared to welcome and receive the new influx. The challenge, therefore, is to try to guide this urbanisation process. Unfortunately, 95 percent of this urban expansion is taking place in those cities least equipped to negotiate the urban transition – the secondary cities of Africa and Asia. As a result we are witnessing the urbanisation of poverty. Today there is an estimated 1 billion slum dwellers. By 2030, this figure may double to 2 billion people. UN-HABITAT’s 2006/2007 State of the World’s Cities report confirmed what we have suspected for a long time: that slum dwellers are more likely to die early, suffer from malnutrition and disease, be less educated and have fewer employment opportunities than any other segment of the population. In essence, the report revealed that we have been confusing proximity to services with access to those services. Living in cities does not immediately translate into a better life, I’m afraid to say. So how is the international community responding? Our estimates showed that some US$300 billion would be required over a 15 year period or roughly 25 billion US dollars per year. While such costing exercises are nothing new and are commonly carried out for many development agendas from health to nutrition, the uniqueness of this exercise lies in the recognition that the urban poor themselves – when properly enabled and empowered – can and are willing to mobilize about 80 per cent of the required resources. My submission is that the urban poor can take care of themselves, up to a point. The urban poor are potentially capable of contributing 20 billion dollars per year to improve their own living conditions. This would leave roughly 5 billion US dollars per year to be mobilized from other sources. We know, however, that aid-based approaches are not enough. Currently, the total international assistance for urban development is estimated at some US$ 2 billion per year. Clearly, we need to think outside the box. We need to think in terms of changing the rules of the game that prevent the majority of the urban population in developing countries from leveraging 20 billion of their own investment with 5 billion from other sources. How can we begin to think out of the box is the reason why FIG and UN-HABITAT are organizing a special two-day seminar as part of this year’s Working Week. 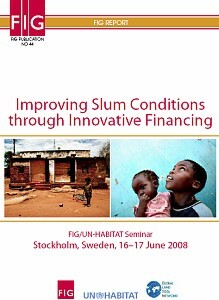 The seminar’s title is “Improving Slum Conditions through Innovative Financing” and it takes place today and tomorrow. Let me outline some of the challenges confronting slum dwellers trying to access land and formal credit arrangements. Some of these messages have been picked up by the Commission for the Legal Empowerment of the Poor. The Commission’s report, launched this month, is a rallying call for systemic reforms to empower the poor. I would encourage you all to read the report. Legal empowerment of the poor is intricately linked to the work of surveyors in facilitating access to land for the poor. Ladies and Gentlemen, allow me to turn to the issue of access to finance. As in the world of land, slum dwellers are often systematically excluded from the so-called ‘formal’ system. In this case access to formal sources of credit. Banks are constrained by the very systems of credit risk analysis they use: financial, legal and technical. Their financial analysis is biased towards people with bank accounts, formal sector jobs and a proven credit history. In their legal analysis, financial institutions look for legally recognized evidence of ownership and the possibility of repossessing the asset through the courts in case of default. And, from their technical analysis, banks will look for proof of a building permit and conformance to zoning regulations. From all three risk analysis perspectives, the poor fail the test of the formal credit institutions and markets. Micro-finance institutions do better for the poor. They will provide small loans. They will not demand land as collateral. However, the loans they give are not housing loans. They are housing loans disguised as consumption or as business loans. This may be a stop-gap measure, but it struggles to meet the full demand for housing loans. There is no evidence that demonstrates that micro-finance has worked for housing micro-finance or for providing infrastructure to the poor. Ladies and gentlemen, there are signs of hope also in the world of housing finance. One model, in particular, involves shifting from individual-based solutions to group or cooperative solutions. Savings schemes are established amongst groups of slums dwellers – mainly by women – who wish to improve their living conditions through a specific project. They establish themselves as a legal entity, which enables them to consider taking a loan. The size of the loan will be determined by their ability to repay. This becomes the basis for designing a bankable project. Financial institutions become interested because the loan size is large and the transaction costs are low. From this model, and others that are out there, it is clear that the poor can provide their own housing solutions. But it means that the other pieces of the slum upgrading puzzle must also be place. This means legal and regulatory pieces. This means participating in land markets. This means getting the planning right. This means reforming land-based tax to create municipal revenue. It also means more participatory municipal budgeting. This means sustainable infrastructure and service delivery. Ladies and Gentlemen, we have to create more sustainable cities. This brings me to the second major challenge I would like to touch upon today: Climate Change. I am pleased that we have Minister Carlgren with us today. I know this is an issue very close to his heart, as it is to my own. It is no coincidence that climate change and urbanization have become critical development issues at precisely the same time. Indeed, the two issues are virtually inseparable. 75% of global energy consumption occurs in cities. 80% of all waste including greenhouse gas emissions come from cities. Roughly half of greenhouse gas emissions come from burning fossil fuels in cities for urban transport; while the other half comes from energy-use in buildings as well as for home appliances. But if cities are part of the problem, they must also be part of the solution. Recent studies have shown that New York City, which has a very high GDP per capita, has one of the lowest rates of per capita Green House Gas emissions in the United States. This is in large part due to the fact that compact cities are much more energy efficient, a major contributing factor to enhanced productivity. Rapid urbanisation and climate change are global challenges that require local solutions. For this reason local authorities will have to play a critical role in responding to these challenges. In this regard, I am pleased to report that, after ten years of work, The Governing Council of UN-Habitat recently adopted a set of Guidelines on Decentralization and Strengthening of Local Authorities. This represents a major step forward in strengthening the role and contribution of local authorities in meeting global challenges. How can surveyors and land professionals contribute to more sustainable urbanization? Better information for better decision-making and planning. For the preparation of the 2008-09 State of the World’s Cities report, we conducted in-depth surveys with more than 100 municipalities. We asked them to tell us the percentage of their city that is informal. 80 percent of the cities came back to us and told us that they did not have to tools or the capacity to answer that question. There is a clear role for the surveying profession to develop low-cost tools and methods to enable developing countries cities to improve the evidence-basis for decision-making. On this note, I am pleased to announce that we have just concluded a two-year agreement with Google to collaborate on new mapping tools using modern technologies. Disaster risk reduction. New land-use planning tools are required to enable cities to both mitigate the risks associated with climate change and to adapt to the new realities. Surveyors have a critical role to play here. New land tools for poor countries. Most land administration systems are not designed to deal with issues such as customary forms of tenure, or overlapping land rights and claims, or limited institutional capacity. As a result, most systems are unaffordable, inaccessible and inappropriate for developing countries. We need to work together to develop new systems. I am pleased that FIG has taken up this challenge. Valuation and tax to strengthen local authority capacity. Land-based tax is one of the principle revenue streams for local authorities, yet most valuation systems are out of date or non-operational. We need new systems to enable local authorities to collect land revenue equitably and to manage it accountably. Developing a new Generation of Barefoot Surveyors and Promoting Volunteerism in the Surveying Profession. There is an urgent need to strengthen the capacity of land professionals in the south. This means, on the one hand, simplified curricula, techniques and tools for a cadre of barefoot surveyors; on the other hand, we need to instill a spirit of volunteerism and a sense of mission in the next generation of surveyors. Lastly, and perhaps most critically, land professionals need to become more aware of their role, and their responsibility, to promote good land governance. As land and natural resource scarcity increases, the pressures from competing interests will increase. Climate change will further complicate this equation. Surveyors need to play a more assertive role in promoting good land governance. Honorable Minister, ladies and gentlemen, it was in Stockholm that the sustainable development agenda was born. I hope that it will be in Stockholm again, this week, that we establish, together, a new agenda for sustainable urbanisation and climate change. Anna Tibaijuka is the first African woman elected by the UN General Assembly as Under-Secretary-General of a United Nations programme. She is currently serving a second, four-year term as Under-Secretary-General and Executive Director of UN-HABITAT. A Tanzanian national born to smallholder banana-coffee farmers in Muleba, Tanzania, she was educated at the Swedish University of Agricultural Science in Uppsala. In October 2006, she was appointed Director-General of the United Nations Offices in Nairobi (UNON), the only UN headquarters in Africa and the developing world. She has served as a Member of the Commission for Africa established by British Prime Minister Tony Blair which resulted in the cancellation of multilateral debt for several African countries by the G8 Summit in 2005 at Glen Eagles, Scotland. In July 2005 the Secretary General appointed Mrs. Tibaijuka as his Special Envoy on Human Settlements Issues in Zimbabwe following massive evictions of the poor in urban areas. She is currently a member of the World Health Organization Commission on the Social Determinants of Health, and is also a member of the Advisory Board of the Commission on the Legal Empowerment of the Poor, co-chaired by the former US Secretary of State, Ms. Madeleine Albright, and the Chilean economist Hernando de Soto. Since 2002, Mrs. Tibaijuka has been instrumental in promoting water, sanitation and slum upgrading globally and in assisting the African Union to establish the African Ministerial Conference on Housing and Urban Development (AMCHUD). She also helped place urban poverty high on the agenda of similar regional bodies for Latin American and the Caribbean, as well as the Asia-Pacific. In its unanimous decision to re-elect Mrs. Tibaijuka for a second term as Executive Director of UN-HABITAT, the General Assembly noted her success in forging strategic partnerships with financial institutions for follow-up investment in housing and urban infrastructure. These include the UN-HABITAT $570 million agreement with the African Development Bank and $500 million agreement with the Asian Development Bank. Mrs. Tibaijuka joined the United Nations Conference on Trade and Development, UNCTAD, in Geneva, in 1998 as Director and Special Coordinator for the Least Developed, Land-locked and Island Developing Countries. She was in charge of capacity building in their trade negotiations in the World Trade Organization, and assisted LDCs, for the first time ever, to forge a coherent and united negotiating position for their special trade interests. In July 2000 she was appointed by Secretary General, Kofi Annan as Assistant-Secretary-General and Executive Director of the former United Nations Centre for Human Settlements (UNCHS), the UN agency for the built-up environment and urban development headquartered in Nairobi, Kenya. She is credited with raising awareness about the global challenge of chaotic urbanization, inspiring a new strategic vision, and significantly enhancing the organization’s performance, management and image. These efforts restored donor confidence and the overall credibility of the organization, resulting in its upgrading into a full-fledged United Nations Programme on Human Settlements (UN-HABITAT) by the General Assembly in December, 2001. She was in turn elected in December 2002 by the General Assembly as the first Executive Director of the new UN-HABITAT programme at the level of Under Secretary General. Prior to joining the UN, Mrs. Tibaijuka pursued an active academic career as a Professor of Economics at the University of Dar es Salaam, Tanzania. She is the author of various books and research papers on agriculture and rural development, farming systems, food policy, agricultural marketing and trade, sustainable development, social services delivery, gender and land issues, and environmental economics. She was an active member of the civil society and the women’s movement. In 1994 she founded the Tanzanian National Women’s Council, BAWATA, an independent non-party affiliated organization fighting for women’s economic and social rights. In 1996 she founded Barbro Johansson Girls’ Education Trust (Joha Trust) that advocates for quality girls’ education in Tanzania and Africa and operates a model secondary school for poor girls, mostly orphans. She is patron of Tanzania Young Entrepreneurs Initiative. She is a member of various professional associations and is a veteran of UN world summits, including the Beijing Women’s Conference, the Copenhagen Social Summit, Habitat II at Istanbul, and the Food Summit in Rome. She is winner of several awards including honorary Doctorate degrees conferred by the University of McGill in Canada, University College London, and Herriot Watt in Scotland. She is a Foreign Member of the Royal Swedish Academy of Agriculture and Forestry and the International Center for Tropical Agriculture. She is a widow with 5 children, one of whom is adopted.